1945 comp. 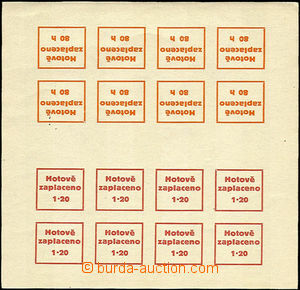 12 pcs of corner overprints Bohemian and Moravian stamp. 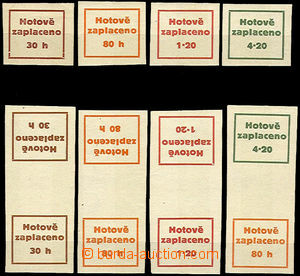 A. Hitler with black overprint "Czechoslovakia / 1945" values 10, 30, 40, 50, 60 and 80h, always after/around two pcs. 1945 Finisch Germania/ Zbraslav above Vltavou(!! ), CDS from 10.V.45 on/for letter card card "with mixed franking of czechosl..". and Bohemian and Moravian stamp. with railway-station cancel. 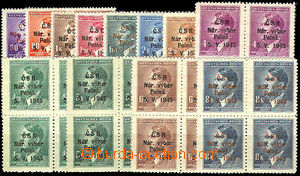 Chrudim 10.V.45, nationalized CDS Zbraslav n./V. 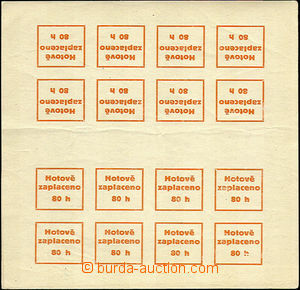 16.V.45, very interesting text from end osvobozovacích fights on/for Chrudimsku, very rare revolutionary postmark! !